Need to connect your Mac to a wireless network? You know the drill. 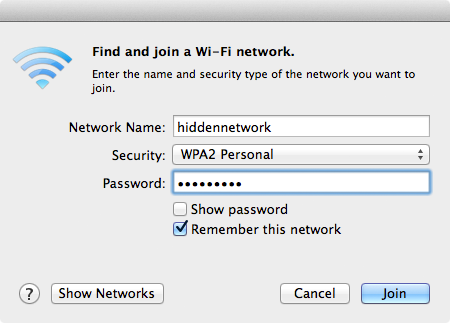 Click on the wireless menu bar icon, select an available network, and your Mac automatically connects. But what about connecting to wireless networks that are hidden? The hidden wireless networks won't appear in the list, so you'll need to use a different method to connect to one of those networks. 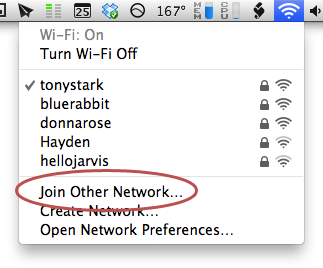 From the wireless menu (on the menu bar), select Join Other Network, as shown below. Optional: Select the Remember this network checkbox to have your Mac remember this network in the future. It's a good idea, especially if you don't want to go through this process all over again the next time you want to connect to this network. Now your Mac will connect to the hidden wireless network. And if you selected the remember this network feature, your Mac will automatically remember and display the hidden wireless network in the future!